We made it back from our vacation. We had a nice relaxing week at the Jersey Shore with friends. Can't beat that. We vacationed with my best friend from College, her husband, and their 3 kids. I made a couple of gifts for the kids before we left on our trip. I made a Molly Monkey for my friend's 4 year old daughter. Harper insisted on one for herself. I couldn't resist especially since the first one I made her looks really pathetic now. I ran out of corduroy so I used a brown polka dot fabric that I had picked up in the remnant bin awhile back. The rest of the fabric I used was scraps and stuff I had on hand. For the youngest I made a baby doll and blanket. I used scraps and fabric I had on hand for this one too. For my friend's 5 year old son I made a furry monster, but somehow forgot to take a picture. I could have sworn I took one, but if I did I can't find it. Oh well. 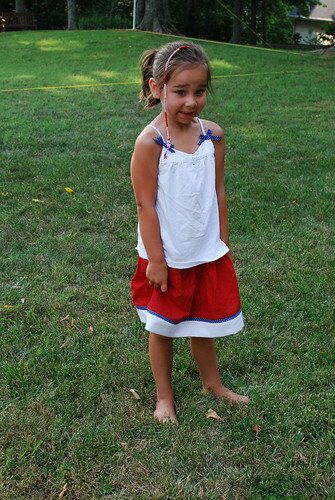 On Saturday, I threw together an outfit for Harper for 4th of July. She was napping so I winged it on the measurements. The waist was a little tight, but the length was perfect. I sewed little bows to an existing tank top to pull it all together. Again, I just used stuff I had on hand. It felt good to use up some of my stash. Visit Carrie for more Crafty Tuesday. That doll/blanket is amazing! 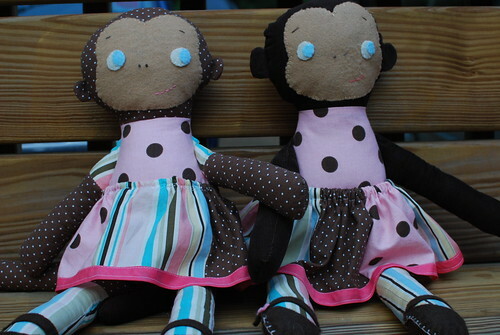 You are so crazy crafty - I want to try making some dolls/animals - and use up some scraps at the same time! So nice! Glad to hear you had a nice vacation...those monkeys are so cute! Harpers outfit is adorable and that baby and blanket is so sweet. Talent...you've got it!! PS-Congrats on the mag spread...don't know if I commented (computer issues) but was so happy for you! You are so uber-creative, I always love stopping by to see what new clever things you've created! 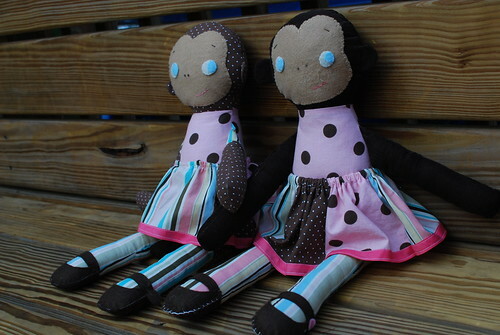 It's also cool to look at your first monkeys and these ones, and see how much you're sewing and design have improved. These look SO high quality! Glad you had a nice vacation! Those are wonderful gifts for the little kids, too. That little dolly in the soft minky fabric is sure to be a lovey. Harpers outfit is super cute, too. I thought I had stash for Anya's skirt, but couldn't find anything. I'm sure she can wear it next year, though, so I'm good for two years with that one! I love the dolls, you should post pics of the monsters. What Jersey Shore did you go to? I also really love that feeling of having used up some of the things I have stashed :-)There are cupbaords full at the moment. I love your polka dot monkey. The pink brown and blue work really well together. You have been so good at using all your scraps for little details. Are you ever gonna show us your space where you create?